My husband and I, unsurprisingly, both showed up to the pumpkin painting party with Disney ideas. I’ll post his amazing Jack Skellington pumpkin soon. 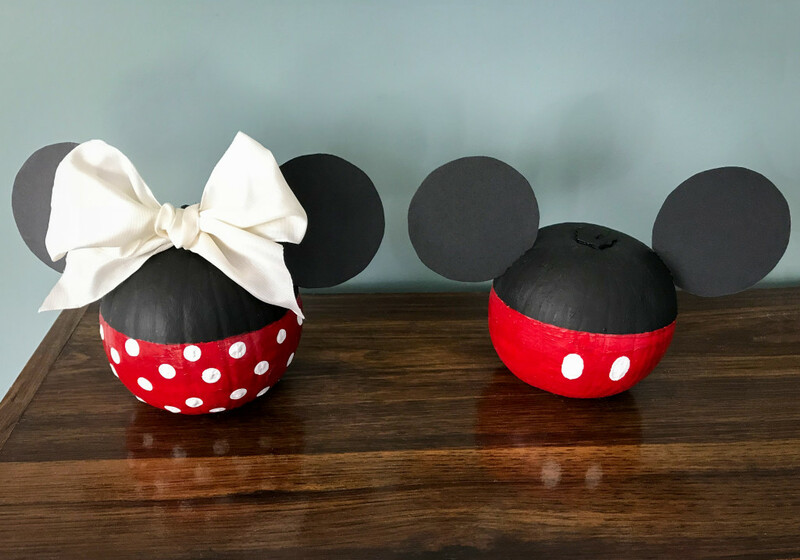 For Mickey and Minnie, I used acrylic craft paint and the help of painter’s tape to make the center line. I stamped the white polka dots with an unused eraser on the end of a pencil. You know I love those polka dots—see the dotting technique in action on Easter eggs, or another finished pumpkin example with gold dots. I used scrapbook paper to make the ears, ribbon for the bow and hot glue to hold it all together. The ears were a bit tenuous—perhaps super glue or a pin would have been more secure? The best part about painted pumpkins (besides the lovely lack of pumpkin guts)? They’ll last all season on your shelf, so it’s not too early to get crafting!